Join the discussion on our forums! 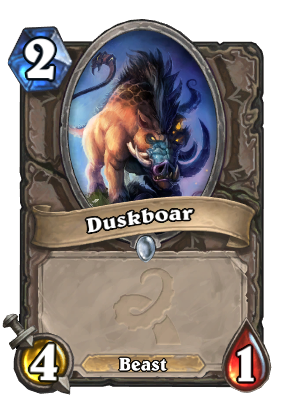 Come discuss Duskboar over in our dedicated Duskboar discussion topic. Its name should be changed to Dustboar. Funny thing is... it was over before turn five. Who thought it was a good idea to release such a niche card? How this didn't win the magma rager awards! I wonder if this card had Charge earlier in the design process, before they finalized the nerfs and their current philosophy towards Charge. Seems like it was meant to be a corrupted Stonetusk Boar. How about Tundra Rhino and Timber Wolfs combo? It's pet, let's face it. It's Corrupted Huffer because it doesn't have Charge! Magma rager, ice one, this guy. Waitin on the 3/1 for 1 next.